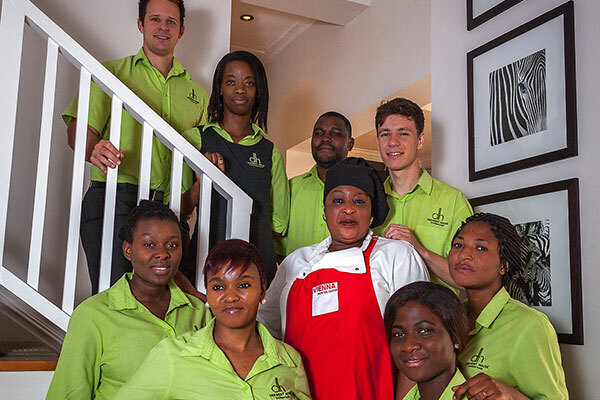 Our award-winning team is a diverse blend of backgrounds and nationalities – just like our guests! Capetonian by choice, Anahid and Armin are respectively Canadian and Austrian by birth. Coming together in Cairo, Anahid spent most of her life in the Middle East and Africa while Armin left his village in the Alps near Salzburg, Austria at a young age to travel the world . . . After living in more than 15 countries across the globe, we’ve chosen to settle down forever in beautiful Cape Town! Luca hails from Durban in KwaZulu Natal and a hospitality background through and through: after experience on cruise ships and holiday properties closer to home, Luca relocated to Cape Town in 2015. Xolani is a fellow KZN native who joins us from a diverse service background in luxury hotels here in the city, while Amalga calls Cape Town home, but her beautiful smile was born in Zimbabwe. Fellow Zimbabwean Kwanele, Eastern Cape neighbour Funeka, and half of our lovely Congolese duo, Sophie make up your housekeeping team, while sister Dorcas looks after you overnight as Night Porter. Her colleague Sydney calls Cape Town home, but comes all the way from Malawi . . . Florence, responsible for our legendary breakfasts, hails from Gauteng but has made Cape Town home for most of her life. Wherever we come from, we’re all here to make your stay with us the very best it can be! Our team is a diverse blend of backgrounds and nationalities – just like South Africa itself! 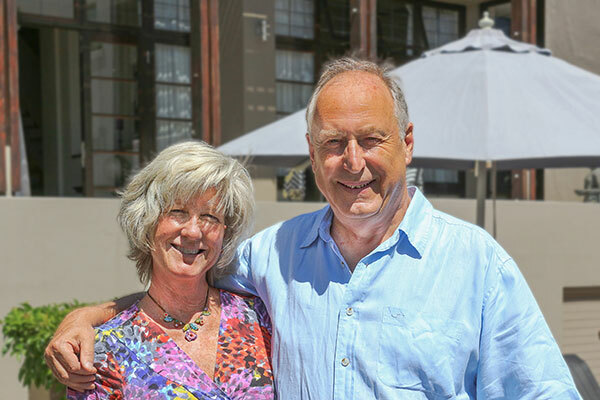 Capetonian by choice, Anahid and Armin are Canadian and Austrian by birth. Coming together in Cairo, Anahid spent most of her life in the Middle East and Africa while Armin left his village in the Alps near Salzburg, Austria at a young age to travel the world . . .
Luca hails from Durban in KwaZulu Natal and a hospitality background through and through, while Vuyo is a Cape girl who found her vocation in hotels after starting out in accounting. Willem is from ostrich capital Oudtshoorn and fled the law for hospitality . Thando, Siposh, Florence and Asanda are Eastern Cape ladies, while the rest of the crew come together at Derwent House from as far away as Congo (our lovely sisters, Sophie and Dorcas) and as close as neighbouring Zimbabwe (Kwanele) . . . all working together to make your stay unforgettable. 25% Off for the month of September! Yes it’s still chilly and there may be bit of rain about (dams are filling up nicely) – But Cape Town’s beautiful this time of year! Come see for your self: we’re offering last-minte bookers through our website 25% off our rooms for the month of september 2018 only. What are you waiting for? Use Promo code “SpringFlowers” when booking to access Special. Book and stay September 2018 only;may not be combined with other discounts. Derwent House is committed to protecting your privacy and data security. o keep you informed of special offers or relevant updates. Derwent House Boutique Hotel, 14 Derwent Road, Tamboerskloof/Gardens, Cape Town, South Africa, 8001. By proceeding further to use our website, you consent to the use of any information provided for the purposes listed above by Derwent House. In this notice, all reference to “we” and “us” refers to Derwent House CC.